Without actually mentioning the word money until after the story ends, this story is designed to show them some of the choices they have in life when it comes to looking after not only their money, but their friends and family. In fact, you should find that this story has parallels in your life whether you are 6 or 60. 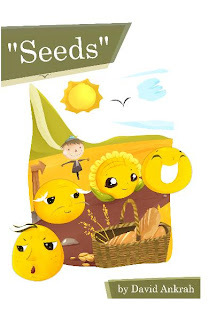 "Seeds" is a fable that teaches a lesson regarding money. It's a short story that takes place in the beautiful land of Zoniye. I read it to my 11 year-old daughter and my 8 year-old son. They were both listening carefully as I started out, taken in by the fairytale beginning. My daughter quickly figured out the story was about how to make use of money. Half-way through, my son seemed to lose interest because the story got into the concept of borrowing with interest. If the book contained more illustrations (there were only two), I think his interest would have held out longer. My daughter on the other hand thought it was a cool story. Even though the story is simple, its message is universal and can be read by every culture. I took the opportunity to discuss with my kids the importance of using their money wisely, the way Palooko did as opposed to Greecho. The themes of saving money, helping others, and living a simple life shine through in this unique fable.